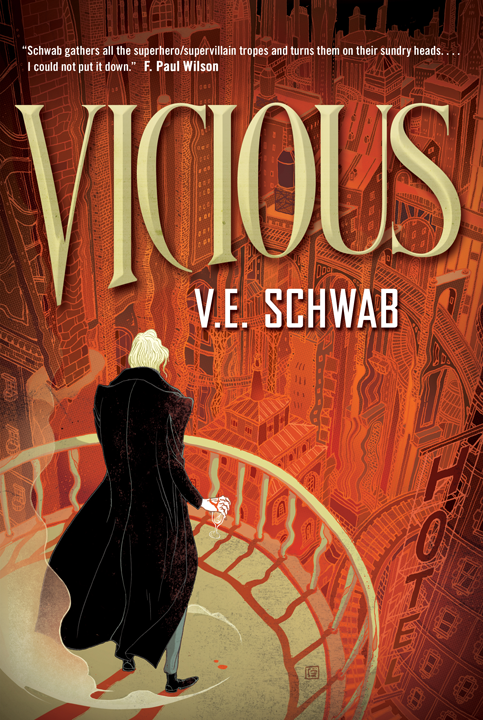 Vicious is a book I honestly hadn’t heard a lot about before I met the book blogger community. I know that at one point, I saw the cover and summary on tor.com, and I probably spotted it a few times while at the bookstore. But I never really had a strong urge to pick it up. I’m not entirely sure why—maybe it was the fact that the setting was neither high fantasy nor sci-fi. Maybe it was because the cover isn’t to my tastes (I know lots of people love it. It’s just not for me.). I’m not sure. Regardless, it took me a while to get around to really wanting to read this book. But as soon as I met some of my book blogger friends, they started pushing this book on me. Relentlessly. It’s something we do, something we enjoy, and, I’ve found, something we (I think of myself as part of the community now, whether I really am or not.) are quite good at. Vicious was one of the books most heavily pushed on me. The main culprits were Nikki, Angie, and Jessie, but there were plenty more of them. Finally, I broke down and asked for the book for my birthday, received it, and I made it my first read of 2015. And I’m glad I did. I tore through the book in only a few days and utterly loved it. I’m rather annoyed at myself for not picking it up earlier, and if you’re just hearing about it now, don’t make the mistake I did. Get it immediately, and go read it. NOW. Oh, alright. I’ll write the rest of the review. But my opinion isn’t going to change. Vicious is the story of two college boys, Victor and Eli, their relationship as roommates, and an experiment gone horribly wrong. It’s a chilling, disturbing tale that is utterly gripping, and simultaneously horrifying and amazing. I really enjoyed reading it. Setting is incredibly important to any novel, and while I may have initially been reluctant to pick up this novel because it’s not a setting I’m familiar with, the college atmosphere was perfectly done. I’m a college student, and I read this book while on break. It gave me shivers purely from the accuracy of the descriptions and their clarity. And while the college is not the entirety of the setting, it plays a large part, and the rest is equally well done. It’s not a new world, built from the ground up, but that doesn’t make it any less perfect. It’s the setting this story demanded, and it was handed with amazing skill. The structure is handled in a way I’ve never seen before. Every chapter happens at a different place in time, and it’s not even remotely linear. The chapters jump from the present, to ten years ago at the university, to the weeks leading up to the main events of the novel. This main thread of events, which happens over a period of a day and a half, from the first chapter to the last (excluding the epilogue), focuses on Victor and Eli’s impending first meeting in a 10 years. While this structure had the opportunity to be incredibly confusing, Schwab has instead crafted a narrative that is unbelievably tense and gripping. It demands that you keep reading, and it’s always ratcheting up the tension until the final scenes, at which point everything comes together with an incredible bang. It’s so well crafted, and it makes me wish other authors would use unconventional structures more often, though I doubt many have the skill to reproduce the magic that Schwab wrought here. But even the best setting and plot fall flat without good characters. I’m happy to report that Schwab’s cast, kept elegantly small, is filled with utterly fascinating characters with fascinating quirks—and abilities. Victor’s past, his problems with his family, and the way he treats those around him paint him as an incredibly engaging, complex character. And while he’s not someone I would ever want to hug—or even be close to—I feel like I understand him. As I do with the other main characters, Eli, Sydney, and Serena. Eli, in particular, I loved to hate as a villain. I’m going to put that down to Schawb’s writing skills and not the fact that I know someone IRL with the name Eliot whom I particularly dislike. In summary, this book has it all. Utterly realistic setting, amazing plot with a cool structure, and utterly enthralling, complex, creepy characters. I’m telling you without reserve to go pick this book up and read it, right now. Five of five stars, and a place on my lifetime favorites shelf without a doubt. Great review! I can’t wait for you to read ADSOM! Almost there! ~150 pages to go in LotR, and I’m jumping in ASAP.